Will Agents of S.H.I.E.L.D. Set Up Hawkeye Mockingbird Romance? Adrianne Palicki was introduced as Bobbi Morse, aka Mockingbird, in the Agents of S.H.I.E.L.D. Season 2 episode A Hen in the Wolf House, and right away, fans knew she would have a strong presence that will surely resonant throughout the entire Marvel Cinematic Universe. She is, after all, an important character in the comic books who has served on various Avengers teams. 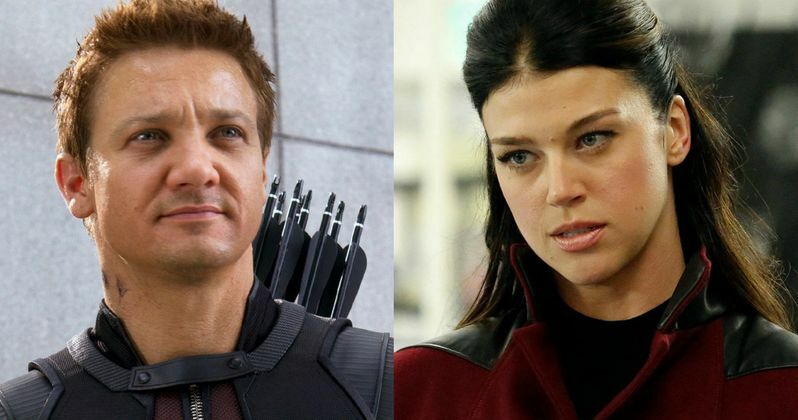 But it's her on-again, off-again relationship with Hawkeye that has fans most excited. Will we actually get to see this love affair blossom on the show or otherwise? Right now, it all sounds like it hinges on Jeremy Renner's availability. He is currently shooting Mission: Impossible 5 right now, has plans for an Untitled Jason Bourne Sequel, and will surely be an important player in Captain America: Civil War. None the less, Mockingbird herself, Adrianne Palicki, feels pretty confident that we'll see some iteration of the romance blossom at some point in the near future, whether it be on the small screen or in one of the upcoming movies, possibly even Avengers: Age of Ultron. "It is a huge part of Mockingbird, of Bobbi Morse, so I'm hoping to see that relationship in the future. So whether it's getting Jeremy Renner on the show, or otherwise, you can't really deny that's a huge part of her character." Mockingbird's backstory is not being followed exactly as it appeared in the comic books. On Marvel's Agents of S.H.I.E.L.D., we've learned that Bobbi Morse was once married to newcomer Lance Hunter, played by Nick Blood. In the comic books, Hunter was actually the leader of Britain's version of S.H.I.E.L.D., but that has changed for the show. The two characters are currently getting along just fine, so it may be some time before Clint Barton, who eventually marries Morse, is introduced into the mix. Though it should make for a nice love triangle.